Blonde shades often take centre stage come summertime. The sun naturally lightens hair, revealing golden and caramel highlights. However, women with brown hair also need to know how to refresh their hair color for the summer season. Let’s take a look at the top 3 tips. Head to your salon before your vacation. Whether your hair is naturally brunette or colored, it’s best to visit your salon a couple of weeks before your vacation to take care of any split ends and boost your color. Your stylist might recommend a full re-color, or simply a Gloss treatment to restore shine. Whatever advice you’re given, it’s best to do this before you jet off so that hair is better prepared to face the sun and salty ocean water. Protecting hair whilst on vacation. If you took our advice and colored your hair before going on vacation, make sure you take the correct steps to ensure your new shade isn’t damaged by the sun, sea or chlorinated pools! 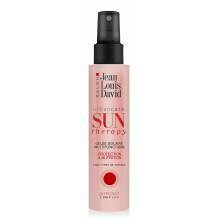 When you get to your destination, make sure you protect your brunette locks with Sun Therapy spray. Spritz all over your lengths to keep your hair looking glossy and vibrant when you return. Your chocolate-colored locks are sure to be the envy of all of your closest friends! Using the right haircare product. During summer, alternate between shampoos that are specially formulated for your color and another which will hydrate your lengths. To get a glossy finish, don’t give your hair the chance to get used to a product. You need to chop and change! Mix it up between Colour Therapy shampoo and one from the Hydra Therapy range to keep your color looking radiant from June right through to August. Hair colouring: how can I warm up my naturally brown hair?